Showing results for tags 'heresy ii'. Hi, this is the first time I have ever been on a forum and I am not really sure how this all works. Any advice is welcome. 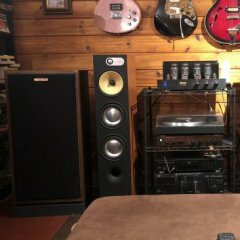 I am a custom cabinet builder and I love speakers. I like to purchase speakers that are in rough shape and build new cabinets for them. I recently took a rp280f that was damaged and turned it into a center channel speaker. 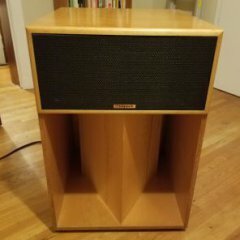 I would like to rebuild a pair of tangent 500 speakers to match but want to make a better cab. I’ve heard people say it has essentially the same components as the heresy 2 but doesn’t sound as good. What can I do when I rebuild them to make them sound better? Can I change the horns to fastrac horns? Thanks. Here is the rp280f that I converted. EDIT: Sold. These were acquired on eBay to go to a middle school band or to my younger son. The band will get KP-201s. My son chose a pair of The Sixes, so these need a new home. I’ll struggle along with a pair of HIPs and DIY “Super Heresys.” These sound great. I’m enjoying Kind of Blue as I type. All drivers work. The networks are original. The grilles are Good, except for no badges. They began life as HBR before they received a dark brown stain job that Stevie Wonder would reject. The cabinets are in good condition and could easily be refurbished to look as good as they sound. 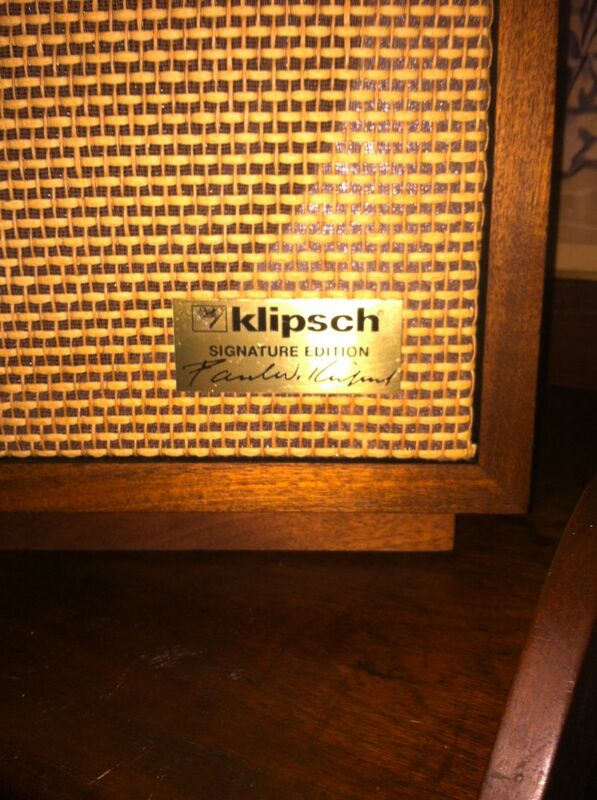 Morning all, My last foray into classic Klipsch was a set of Forte where I couldn’t survive the demo. Possibly part of it was the hard room, and possibly part of it was the Carver receiver it was hooked up to. However, I left them at the seller’s home, as their sound was not for me. 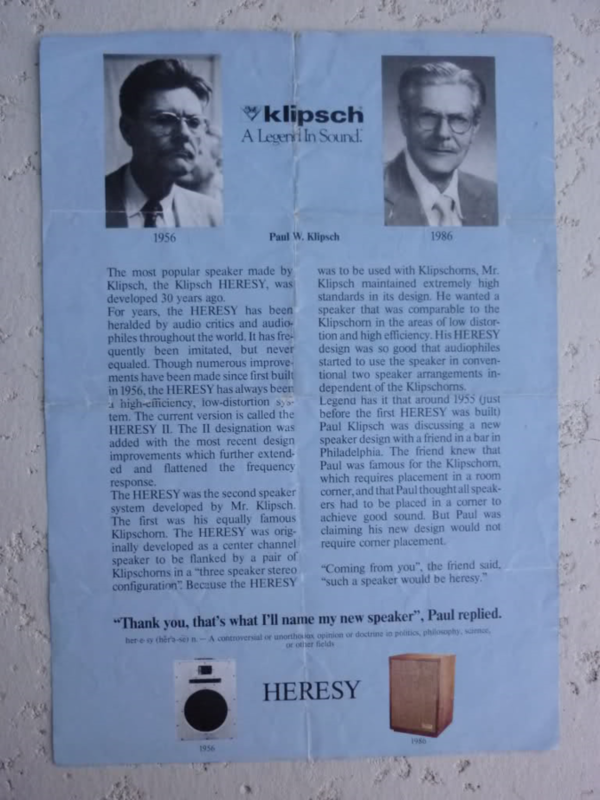 Now a set of Heresy II have come available locally, and I am curious to if they are worth pursuing, based on my experiece with the Fortes? Welcome your options, friendly Klipsch community. I have read stuff on this website for a long time but this is my first post, so thanks in advance for any help. I have a nice pair of heresy II's but was thinking about having some tangent 400 cabs built and transferring the components of the herersy's to get better/lower LF. A) has anyone done this? B ) does anyone have the plans for tangent 400's (cant seem to find any online) C) if anyone has done this is it worth the effort? Bought these back in the early 1980s, have them sitting in a closet for 20+ years,so best to move them to someone who will use and appreciate. Great shape, USA made, stained pine, will send photos or more info as required upon request, howardende at hotmail dot com. Seeking $500/pair, not including shipping. In upstate, ny and I would be willing to meet locally for transfer or mail charging actual costs only. 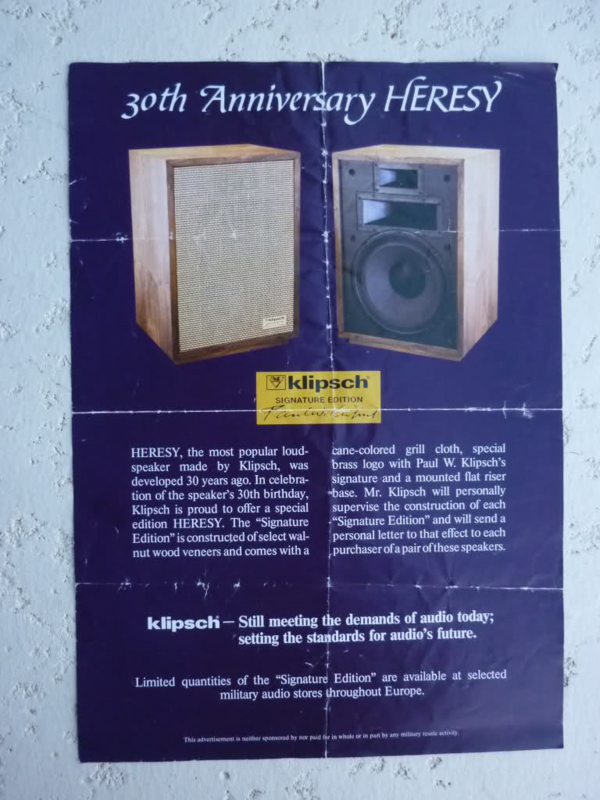 I have a pair of Klipsch Heresy speakers for sale. They are factory sequential numbered. Serial numbers are 37R348 & 37R349. They are in excellent condition, with one small area on the lower left back corner of the 348 speaker (see photo). Walnut finish. Made in 1977, I have owned them since 79, bought from a friend who upgraded & they have been with me since! Also have wooden floor stands for them that are included. Hopefully, all my pictures come through. Prefer local pickup, but I am willing to ship if you're willing to pay! Any questions, let me know. $600 I'm in the Sarasota, FL area. ratcobob posted a topic in Alerts! I just bought 4 KP-201A's from which I have restored two into perfect condition. The two I have left have 1 missing woofer, 1 wrong (Eminence branded) woofer, a blown squaker, 1 missing grille, and a blown tweeter. I want to get these two speakers restored, but I'm not sure to do about the missing parts. The woofs should be K-24-K's, and the tweeter should be a K-76-K, and the squaker should be a K-53-K. I plan on making a new grille using one I have as a template. I would like to find 4 good black and white Klipsch badges if I can find them for not too much. BTW, these speakers sound fantastic! Cut Sheet Link to Product Info Thread?